Photos save our memories, yet fumbling to upload them can cut those moments short. But Flock lets you snap and forget, and then later collects photos from you and friends you were with into privately shared albums. Flock for iOS combines brilliant social design with the underutilized photo location API to simplify sharing. Instead of clumsily selecting privacy settings, it suggests you share with any of your Facebook friends who use Flock and also took photos at the same time and place. Flock is the new app from the makers of Bump. Alongside Pay With Square, it could lead a movement of apps that we don’t have to remember to use, but instead just magically take care of us. Bump is one of the most popular apps of all time. It will hit 100 million downloads later this summer, and has $20 million in backing from Y Combinator, Sequoia, and Andreessen Horowitz. Bump set out to solve the problem that when you meet someone new, your interaction shouldn’t be interrupted by fiddling with email, SMS, or writing a note to exchange contact info. You just physically collide two devices with Bump installed and it transfers your contact info. The same philosophy of preserving human interaction and preventing us from having to stare at our devices was built into Flock (yes, same name as the defunct social browser). It’s designed not to tack on additional actions to the photo shooting behavior. Facebook and Instagram are great, but it’s sad to see people diverting minutes they could have spent experiencing life with their friends so they can broadcast their photos to people who aren’t there. Flock doesn’t even have a camera built in. It wants you to take photos and then put your phone away. Later when you leave the geo-fenced location, it sends you a reminder push notification to share your photos. Open it, and your share is pre-populated with an album of all the photos you took in that session that will be visible to other Flock Facebook friends who were there. You simply remove any photos that aren’t worth sharing, approve, and they’re uploaded. Your friends then get a push showing them the photos, and asking if they’d like to contribute their own to the collective album. As more people add in, the album grows with new perspectives. If you want to send the photos to people who weren’t around when you took them, you can copy a shortened link for private sharing or post the album to Facebook. Bump’s co-founder and CEO David Lieb tells me Flock might generate revenue down the line with a premium version filled with extra features. 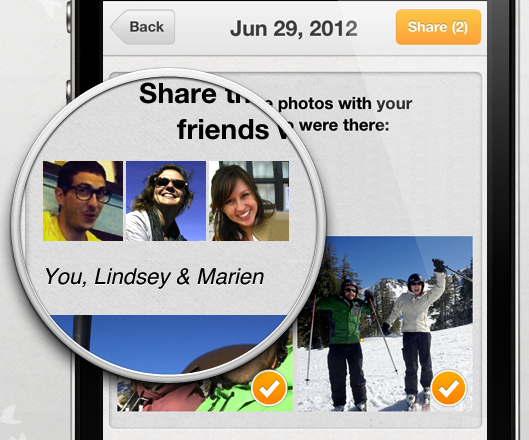 Flock is truly different because it shifts photo sharing from selection to omission. With Facebook, Instagram, or other services you usually only share one or a few photos at a time. But that neglects the beauty of digital cameras — you can take as many photos as you want. 40 photos of your ski trip might not be relevant to everyone you know, so broadcasting them could be overkill. The people who were on the slopes with you would probably love to check out all your shots. They don’t have to nag you with the chore of uploading them to a social network or sending them over email, though. This lets Flock surface trapped memories. Yes, you’ll need to be aware of what you’re sharing naughty or embarrassing photos don’t escape your phone, but that’s worth it for all the friction Flock cuts out. And since it works retroactively, go install Flock and you might get receive an album from a birthday party or concert you and all your friends were at but had never seen photos of until now.